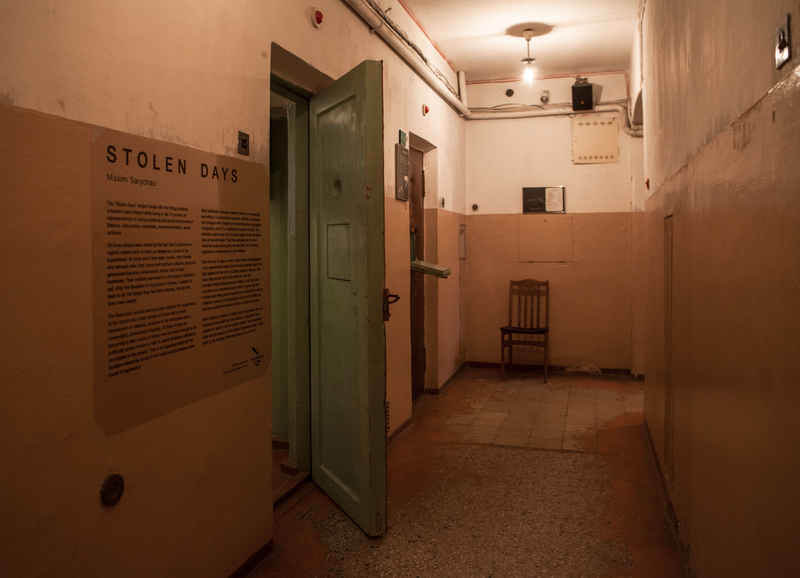 The “Stolen Days" (2014-2017) project deals with the things political prisoners have missed while being in jail. It focuses on representatives of various political and social movements of Belarus: nationalists, anarchists, environmentalists, social activists. All these people were united by the fact that Lukashenko’s regime viewed each of them as dangerous; forces to be suppressed. At some point their daily routine, their friends and beloved ones, their plans and habitual customs, joys and grievances became unreachable, stored only in their memories. Their realities narrowed to a life inside a detention cell. After the liberation of my project’s heroes, I waited for them to do the things they had been missing. And at that time I was nearby. The Belarusian special services have adopted the experience of the Soviet era: covert arrests at home and at work, harassment of relatives, pressure in the workplace and in universities, conversation tapping. All these things are becoming a new routine of those who are brave enough to be politically active. Around a half of asked detainees refused to participate in the project. This is an expected result for the situation where the focus of the media could provoke a new round of repression. Most politically motivated arrests in Belarus are conducted according to a standardised scheme: activists are detained and charged with violation of the Administrative Code (petty hooliganism, Art.17.1 or resistance to police Art.23.4). The detention reports are set on carbon paper, where the police also act as witnesses. Then the case goes to the court, where the judge gives guilty records after 10-15 minutes, regardless evidence given by the defense. Over the last 20 years, arrests, heavy fines and propaganda in pro-government media have become essential tools in the fight against all the forms of public protest in Belarus. This tactic has proved itself to be effective. 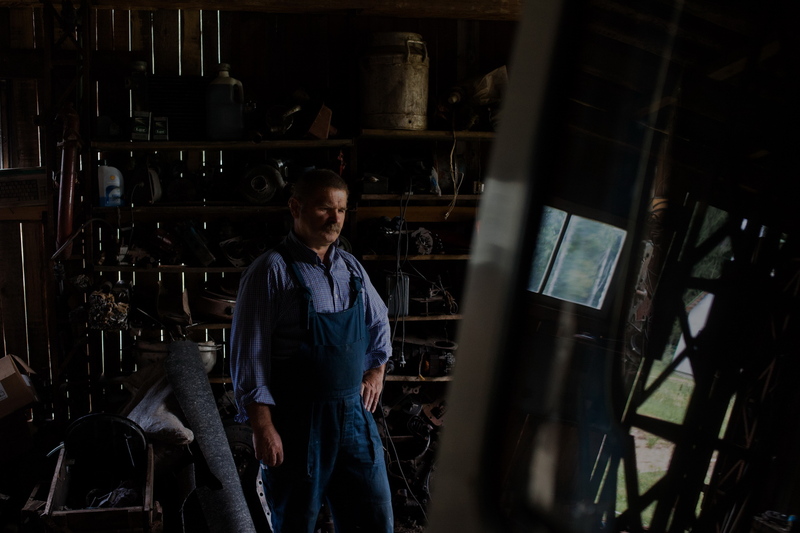 Very few critically-minded Belarusians are willing to risk their work, education and sometimes even health. It seems that this fruitless and often painful experience is embedded in nation’s collective memory. A combination of fear and inactivity has become a pattern of behavior and a condition of survival. When talking to dozens of adults and young people, who are extremely brave and love their country, I asked them one question to which I had no answer myself. I was wondering what was the way out of the state of stagnation Belarus finds itself at the moment. What each one of us could do? 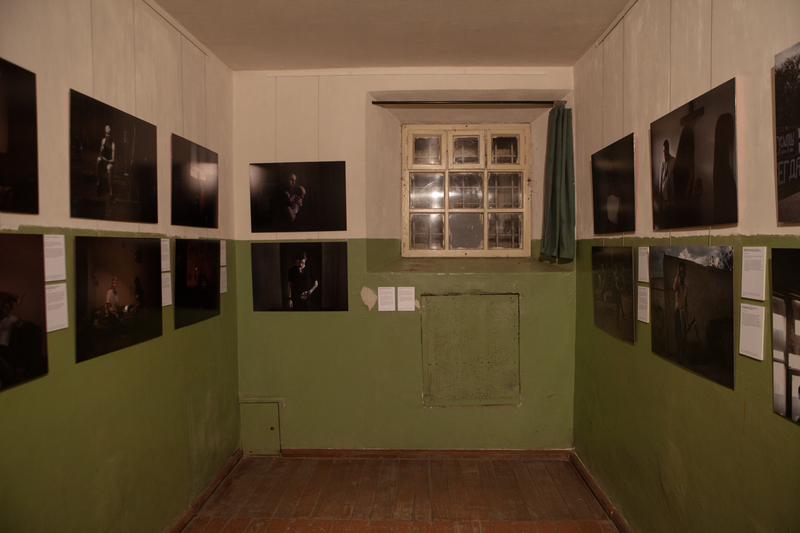 Solo site-specific exhibition in prison cell of former KGB prison. Venue: Museum of genocide victims, Vilnius, Lithuania. 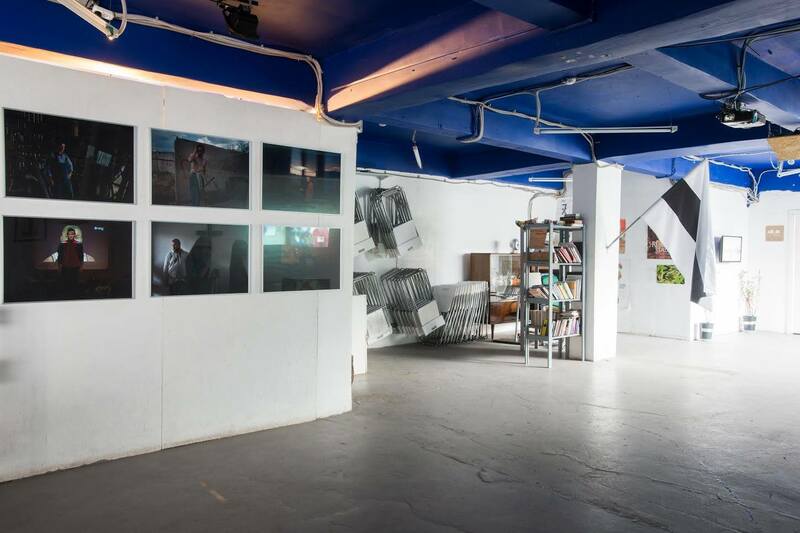 Group exhibition "Talks about politics. 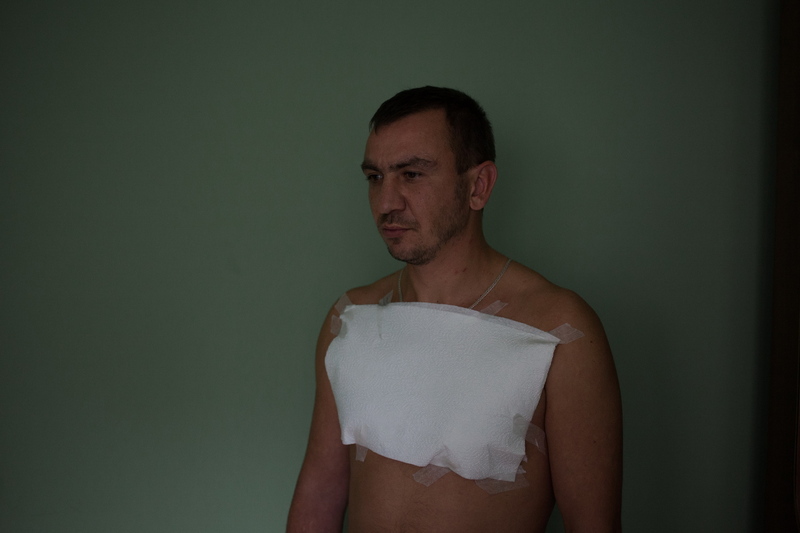 Critical art in Belarus in 10-x"
Denis Karnov, 30, former political activist. Denis is working in the building industry, in the past was an active political activist. During the arrest Denis was going to finish a big tattoo on his chest. He managed to do it only four months later. On photo: Denis Karnou after tattooing. September 23th, 2014, Soligorsk, Belarus. Eugene Skrebets, 27 years old. A freelance journalist. Eugene was arrested at the entrance to his house, when he was coming home after work. He works at the radio "Racia", which does not have a permission to broadcast legally in Belarus and thus broadcasts from Poland. Eugene explains his arrest by his journalistic practice, in particular connecting it with his coverage of the Ukrainian events in winter 2013-2014. During his imprisonment, he missed a Belarusian language course "Mova Nanova." Assisting in the organization of this course, he promotes the Belarusian language in his native city. On photo: Eugene Skrebets during the discussion which follows watching a film. June, 28th, 2014, Brest, Belarus. Sergey Matskoyts, 42 years old, an activist of "European Belarus" party. 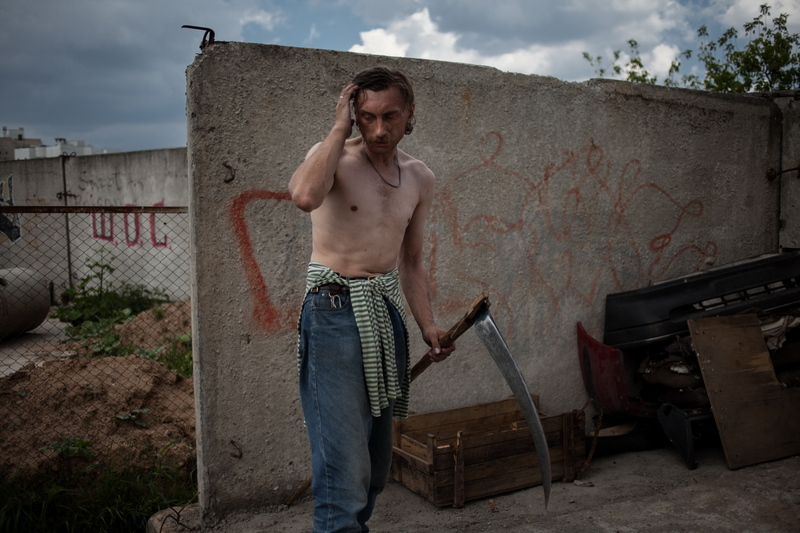 Sergey works in a garage cooperative, combining this work with a part-time job at "Belarusfilm" production studio. The trial over Sergei was held behind closed doors (without a lawyer), and took about 5 minutes. For the first 3 days he slept without a mattress and a pillow. It was very cold in his cell - people filled in bottles with hot water in order to keep warm. During his imprisonment Sergey was taken out for a walk only twice. "There are no laws in Belarus, there is no order. Anything can happen – at any time you may be detained or beaten. Such actions have become a norm. Nobody is protected." On photo: Sergey Matskoyts mows grass at the garage cooperative, where he works. July, 8th, 2014, Minsk, Belarus. Aleksandr Kurbatski, 27 years old, a football fan. Since 2001 Alexander has been a fan of the football club “Torpedo” (Minsk). During his imprisonment he missed the Belarusian championship three most important games. “Torpedo” is one of the few football clubs in Belarus, which is entirely sponsored by its fans. "To become a person who is considered to be unwanted by the regime it is enough just to love one’s country, its history and traditions. I think that the worst time for the Belarusian ultras (football fans) is yet to come. The propaganda already exploits an image of the young drunk fan. Our country seems to have a need only in ice hockey and ignorant “herds of people”." On photo: Aleksandr Kurbatski during a “Torpedo” football match. July, 12th, 2014, Zhodino, Belarus. Vyacheslav Kosinerov, 27 years old, an activist of the initiative "Environmental Poshug". During the arrest, security forces broke his jaw. He was kept in handcuffs in hospital for 3 days, charged for painting an illegal graffiti under Article 339.2 "Malicious hooliganism" (imprisonment for up to 6 years), but thanks to the public outcry the court dismissed the charge. Instead of staying in hospital he was planning to be home with his family. «I was fed through a straw and was losing about a kilo a day. All this time I was kept in handcuffs. I even slept with the handcuffs snapped to the bed. There were three policemen to guard me changing their turns every 12 hours. The authorities are ready to break us, because they see us as ideological enemies. They need money, so now they are muzzled, in other times they would have destroyed us. The fact they treated us in such a cruel way proves that they fear thoughts and ideas. Any violence is a fear indicator. On photo: Vyacheslav with his daughter Alisa in his house backyard in Minsk suburbs. November 28, 2015, Minsk, Belarus. Alexander, 25 years old, a street football player. Alexander was detained with his girlfriend Nastya Kuchta in the city center. The police had tracked their location by mobile phone signals. Alex missed three games in the championship among teams which adhere to anti-racist views. "I spent the first night at the police department in an empty cell sized 4x4 meters soaked in urine. I remember black mattresses in jail. Close to the end of the detention period we were given bread with mold. When I was released, the first thing I did was to shave off my mustache and go for a walk around the city. It does not matter whether you are an oppositionist, an athlete, an activist or an alcoholic. If there is an order, the repression machine will crush anyone. But this story has made me stronger thanks to all the people who were supporting me." On photo: Alexander together with his friends has a rest during the break in a mini-football match. July, 9th, 2014, Minsk, Belarus. Aleksandr Kurets, 27 years old, a volunteer of the initiative "Food Not Bombs". Aleksandr is fond of weightlifting. He cooks and shares food with the homeless. During his imprisonment he missed 7 training sessions. "Unfortunately, I believe that in the next 10-15 years there would be no perspectives. Nothing would start to change as long as people continue to wait for "a good uncle". In order to change, we need to learn to take responsibility, to work, to have a conscious approach to what we do. And to start with, it is enough to give up ostrich attitude". 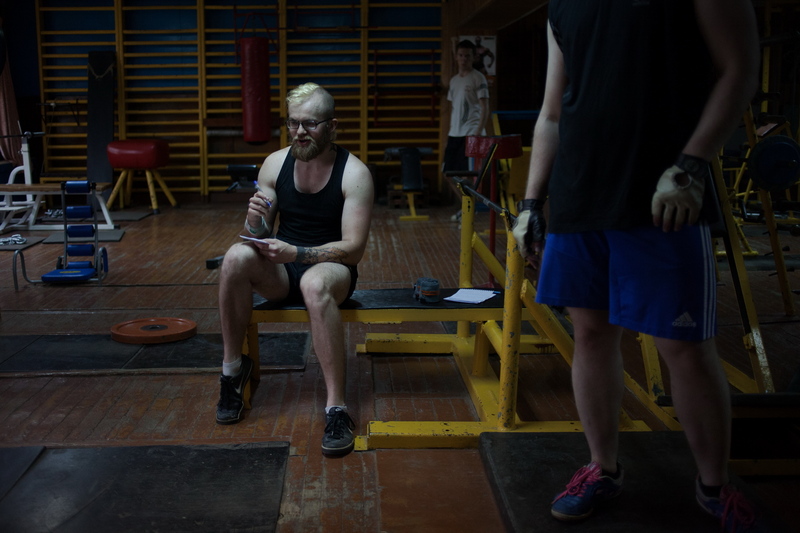 On photo: Aleksandr Kurets at his weightlifting training. June, 12th, 2014, Minsk, Belarus. 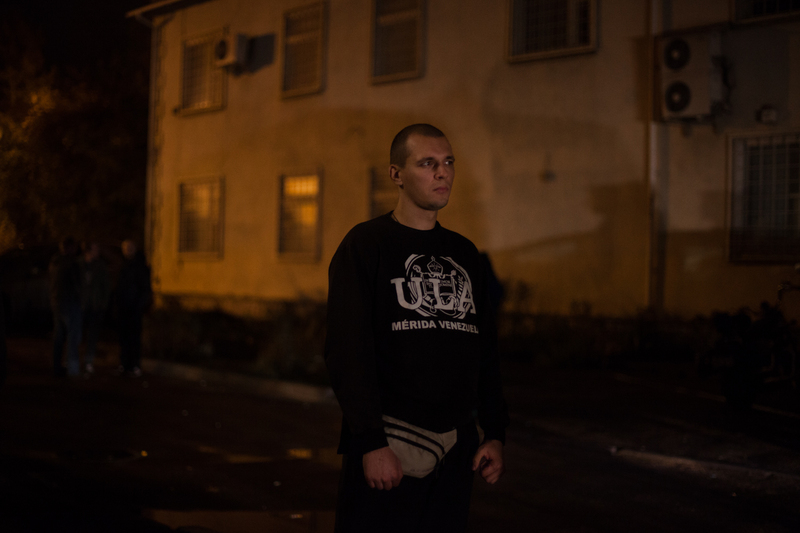 Nikolai Demidenko, 25, an activist of "Malady Front" political opposition party. Nikolai was an active member of "Malady Front" political party two years ago. He is a practicing believer. During his imprisonment he missed a few church services. "One of the most important things I missed was a church service, every weekend we attend church together with my family. Six months before these events we had already bought the tickets for the whole family to travel to France. But my wife Alesia accidentally washed my passport. I remember seeing my wife off at the airport, returning home and being detained." On photo: Nikolai Demidenko (on the left) at a church service in a Greek Catholic Church. June, 21st, 2014, Minsk, Belarus. 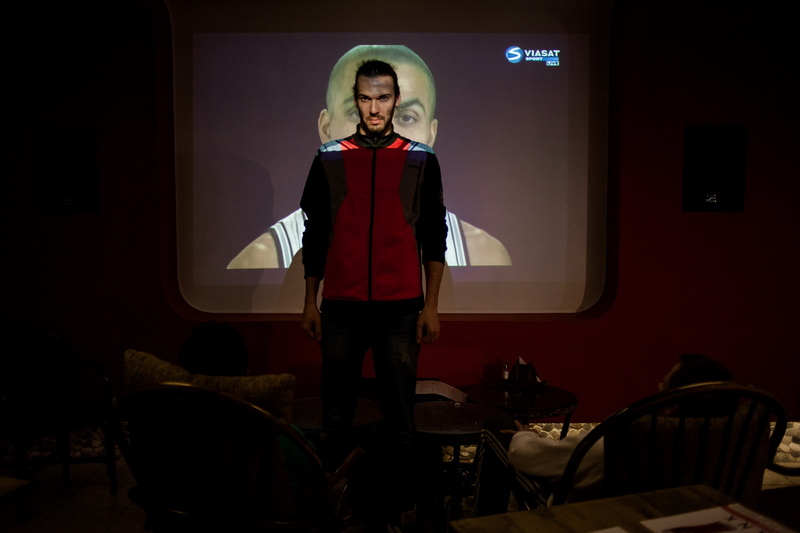 Sergey Kazakov, 22, a civil society activist. Sergey plays the bass guitar in a rock band. He works as a barman in one of the Minsk casinos. During the detention he missed the concert of his band. Sergey had been sentenced to 3 years of imprisonment during the protests which followed the presidential elections in 2010. He spent 7 months in prison, after which he was released because of an amnesty. "For the authorities there are no innocent people, and sooner or later repressions will affect everybody. The only thing that they was not yet stolen is an opportunity to be humans who did not forget about their pride, duties and are able to protect their interests and values. To be a real human is still our personal right." On photo: Sergey Kazakov at the backstage of the Palace of Culture before the concert of his rock band. June, 7th, 2014, Baran', Belarus. Leonid Smovzh, 54, a social activist. Leonid worked as a rail car machinist. After several detentions made during opposition protests he was forced to quit a job. Because of the arrest he had to suspend a construction of the house for his family. At the elections in 1994 Leonid voted for Lukashenko. He started taking part in protests in 2013. He explains his decision by the discontent with his mother’s low pension ($ 18), who had spent all her life working at kolkhoz. "Now people who the regime is not afraid of take part in opposition protests. They walk, show their posters and just go away. I do not see an opportunity for changes in the next 6 years." On photo: Leonid Smovzh, in the garage of his house under construction. August, 17th, 2014, Minsk, Belarus. Dmitry Dashkevich, 33 years old, the leader of "Malady Front" political opposition party. Dmitry is a former political prisoner and he spent 2.5 years in prison after the events of December, 19th, 2010. He was planning to stay at home with his family, partially due to the fact that he was under preventive supervision of the police and after 8pm he was not allowed to be outdoors. "Only God knows when and how changes will come to Belarus. But they will come, they surely would. To bring these changes, each of us has to be an example for people who want them. Since in the past 20 years not a single person is left in Belarus who needs to be proved who Lukashenko is. For example, I cannot remember persuading anyone against the political regime of this country for the last 5 years – neither in prison among other prisoners, nor at police departments among policemen." 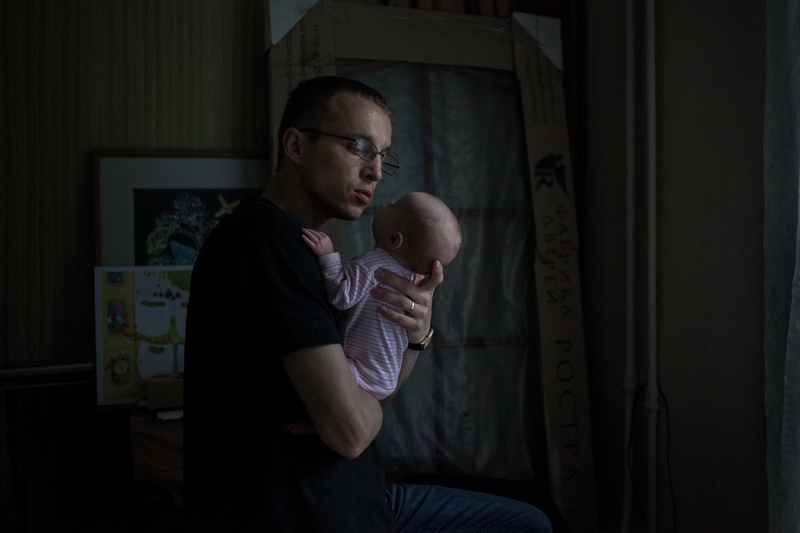 On photo: Dmitry Dashkevich with his daughter Mara at home. July, 23rd, 2014, Minsk, Belarus. Andrei Tkachov, 27 years old, a fitness-trainer. Andrei works as a fitness-trainer. During his imprisonment he missed a few games of the NBA Championship. His friends brought into his cell the printouts of the matches. "Prison lacks basic things, for example one would wish to get some fresh air or take a shower. I was also not happy with the meals. They were arranged in such a manner that the last meal of the day was at 6 pm, and you had to spend the rest of the day hungry. Also there are some problems with the food calories, being there I actually lost 9 kilos." On photo: Andrei Tkachov (in the center) watches a NBA match (the National Basketball Association) with his friends in a sports club. June, 13th, 2014, Minsk, Belarus. Roma, 19 years old. Punk-anarchist. During the arrest, he was going to meet with his friend Sasha, which he had not seen for a long time. Roma was detained during the breakdown of punk concert by riot policemen in January 2015. He was staying close to punk distro (CDs, books, T-shirts) and attracted the attention of police. "For 10 days I have changed five cameras. I remember the attitude of people towards each other. There were thieves and vagabonds, and drinkers, and ordinary men, but we were all on equal terms." On photo: Roma at home with his friend Sasha. January 25, 2015, Minsk. Vadim Zharomskyi, 26 years old, social activist. Vadim and his friend were arrested by special forces at home. He was charged for painting an illegal graffiti under Article 339.2 "Malicious hooliganism" (imprisonment for up to 6 years), but thanks to the public outcry the court dismissed the charge. After the detention he lost his job because his employers feared pressure from the authorities. He also missed the concert of his favorite band “Dzieciuki”. We were lying on the floor, handcuffed. From time to time stun guns were used against us - on the back and legs - as a way to get our testimony. During my stay in prison pressure was exerted on my parents, too - our house was searched. My mother had a recent surgery, due to which she was recognized disabled. And it was one of our cracks they had been trying to tap to break me. I tried to keep calm. It was important not to show fear. I subconsciously keep in mind that I am eavesdropped and surveilled. On the eve of the presidential election in 2015, every day I used to notice a few people who were watching us. But I do not want to leave the country. Otherwise it would be their victory - they want to make all the active people leave Belarus. On photo: Vadim in the club backyard during a concert of his favorite band “Dzieciuki”. October 25, 2015, Minsk, Belarus. 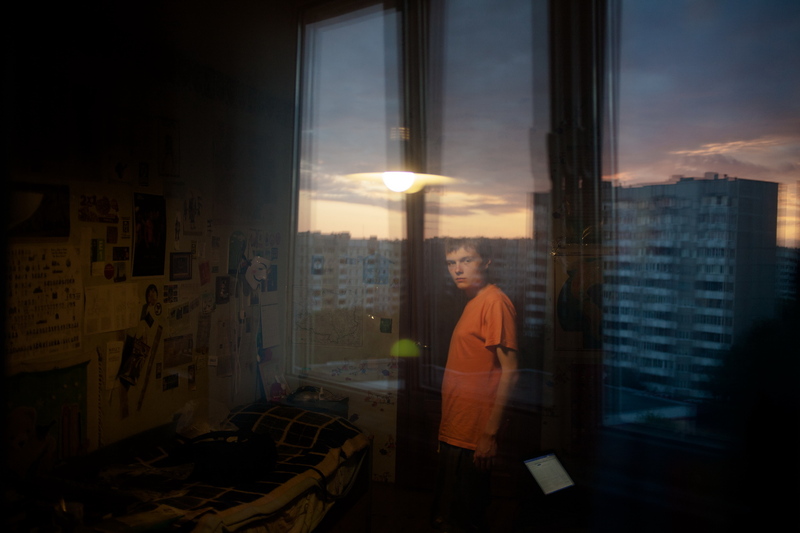 Valera, 18 years old, a social activist. Valera is a BSUIR student. He missed 3 weeks of studies. "I think that the current political authority fits people's needs. And I do not believe that the transformation of the current authoritarian regime to a more democratic one will bring any changes. Changes must be initiated by the people, not from the state." On photo: Valera at his home during his preparing for the exams. June, 10th, 2014, Minsk, Belarus.